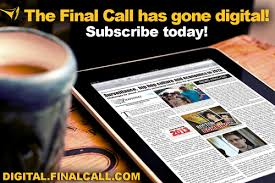 MEMPHIS (FinalCall.com) - The Honorable Minister Louis Farrakhan issued blunt warnings Oct. 18—commemorating the 14th anniversary of the Million Man March—to the United States government, to the Black community at large, and to Black clergy and other leaders, that conditions today in this country are as bad as they were before the historic march, except that now there is not enough time to stage another march to save us. “The vision of 1985 was the driving force behind the actions that we took, but 14 years later as we meet here in Memphis, Tenn., we are now at the same crossroads again, where now the killings have gone back up. The crime rate that went down after the Million Man March has gone back up. “When people see our young Black men, they recoil. 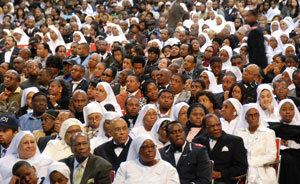 They're afraid now because the violence in the inner cities has gotten out of control,” the 76-year-old Nation of Islam leader told more than 7,000 during a two and a half hour address at the Cook Convention Center here. “Now, the killings have increased in all the major cities of America, and leading Black thinkers are now calling for the National Guard. “Some people say: ‘Farrakhan, you need to have another march.' No. That's over. I'll never go back to Washington like that ever again. In fact, we don't have time. If you don't get your act together, you will see blood in the streets and you will fulfill that which is written in the scriptures, that there will be blood up to the horse's bridle. “Let me say something to you. You elders that have abandoned responsibility to our children; preachers that don't want youth in the church because they don't tithe, so we don't go after them to save them; leaders who lead for the people that give money to their organizations; I want you to hear me, because the chastisement of God has entered America. One calamity after another, as fast as one goes, another one is coming. “Let me tell you. You think Farrakhan is some nut. You think that my teacher, Elijah Muhammad was some crazy man. 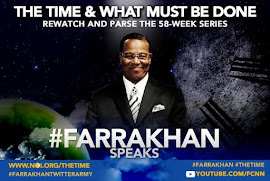 But every one of you will have to bear witness before long that God did indeed visit America, and indeed he raised up a Messenger from among us who is the promised Messiah,” Minister Farrakhan said. The toxicity is filled with self-hatred that results in destructive behavior toward one another, and will ultimately lead to the destruction of those communities. Instead, the Muslim leader urged his listeners to pray for President Obama and not expect him to solve the problems of the Black community. “You have to understand that he was voted in to take on the affairs of a nation, not yours and mine. He is the American president, not the Black president. 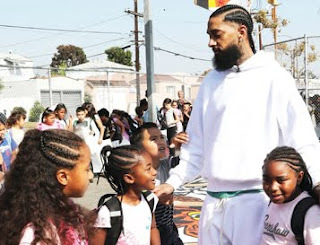 We've got to marshal our energy and talent to do for ourselves,” he said reiterating the Nation of Islam mantra that has transformed people who were thought to be beyond redemption into a productive force in the society. Min. Farrakhan also had a warning for Pres. Obama. “The shock of the hour is a grievous thing. It's coming to America. I'm saying to my president, my brother: as I told you back in February, try to find a way to get out of Afghanistan in a way that saves the face of America. Before Min. Farrakhan's address, several city officials thanked the Nation of Islam for commemorating the 1995 Million Man March in Washington in Memphis and praised the N.O.I. leader. “His message is one that we all need to hear, heed and follow because it's a message of self-reliance,” said Mayor Pro Tem Myron Lowery. “We are honored to have him in the great city of Memphis,” Mr. Herenton said. “It was easy for me as a mayor to present a key to the 19th largest city in the country to a man who is worthy, to a man who speaks truth, to a man who possesses wisdom, to a man who is courageous in thought and in action, to an anointed man,” said Mr. Herenton, who was the first elected Black mayor of Memphis. Min. 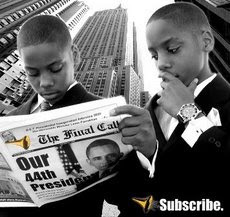 Farrakhan's Holy Day of Atonement/Million Man March anniversary speech was scholarly and academic, and at the same time prophetic. 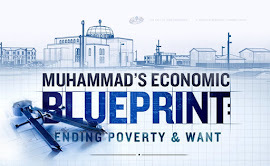 The Nation of Islam has consistently shown the world a blueprint for helping people repair their lives: recruiting converts in prisons and those who were otherwise lost and abandoned on the streets, and transforming their lives through adherence to the teachings of Islam. “They're going to prisons and they make a man and a woman whole, the prostitute gets cleaned up, the drug addict gets changed,” the Minister reminded those in attendance as well as tens of thousands more who watched via a live Internet broadcast. 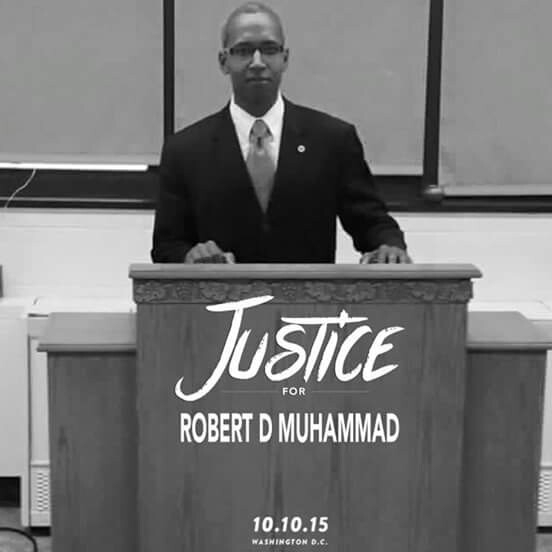 “You see a model in Muslims in the Nation of Islam when our people come into the mosque toxic and then are made useful. Warning that his time to speak among the people may be drawing short, Min. 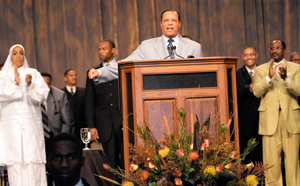 Farrakhan cited the complex “government” of the human body: nine systems, including digestive, skeletal, nervous, circulatory, and others, all ruled by the brain, as evidence of how a true theocracy will operate, and how all of the earth's 6.5 billion people can live together in harmony and prosperity. “If we study this magnificent body ... we can relate all these 10 systems to 10 ministries with subgroups and tasks forces that will allow us the privilege of building our own communities,” the Muslim leader explained. 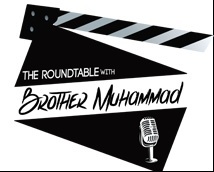 (The Honorable Minister Louis Farrakhan upcoming lecture series, "The Time and What Must Be Done" is scheduled to be freely available to the public live via webcast @ http://www.noi.org/webcast/ beginning Sunday November 8, 2009 at 10:00am Central Time).